The last two posts looked at some vocabulary & expressions which are or were said primarily in the Québec city region (I say “were” because a number of the examples have fallen out of disuse with younger generations). The next few posts will look at vocabulary samples from other regions of Québec. 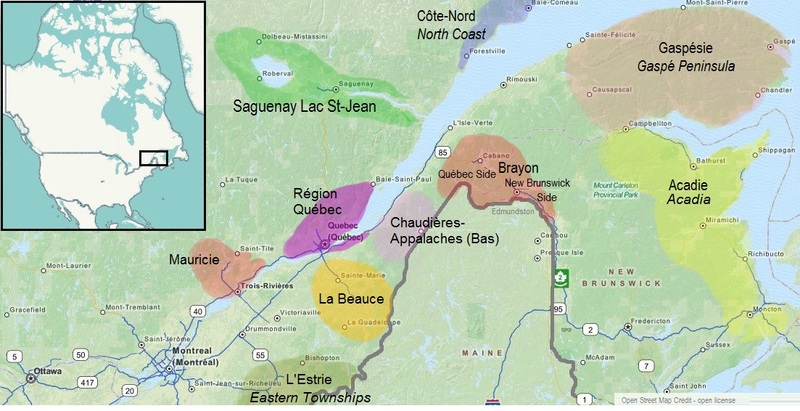 One note regarding the map… the regions are “approximate” (I purposely wrote “Bas” Chaudière-Apalaches because I already filled in much of the Chaudière-Apalaches region with the Beauce Region – they overlap). Also the Brayon speaking region is actually a region with its base in Northeast New Brunskswick, but which influences the vocabulary across the provincial border in Québec (a sort of “Acadianization” of Québec French). Word “Y”(this would be the equivalent which could be heard more in the Montréal region or province-wide). I will also include the English equivalent as well as reference notes. Again, just keep in mind, there is no hard and fast rule about this vocabulary. Things change with time, some of these may be odd-balls or not always said by the majority, geographic lines are blurry for words and expressions (therefore you may hear these words outside this region), and individuals may say things differently. Below is some vocabulary from the Beauce region. Où est-ce que… ? = Where is? (Elsewhere in Québec, including Montréal, and elsewhere in Canada, in spoken French you will often hear “Où ce que…? or “Où ce qu’y est le/la…?” — a very informal way of posing the same question, and which I myself am guilty of saying more often than not). rien = nothing. The first part is pronounced like an English “ah”, but the “H” is said with a big, pronounced expiration. The adding of a heavily aspirated (breathed) “H” to many words is quite characteristic of language from La Beauce. embarquer = to get in (a vehicle). Note, people in more rural areas of La Beauce with often change a hard “K” or “Q” to a “TCH”. poudre – powder. Note, an “r” is sometimes added after an “ou”. This can also mean coke (like cocaine). One can argue that a good number of the above are simply pronunciations transformations, which I suppose many are. Many other words follow the same type of pronunciation transformations. You can hear some of these accent transformations in the post which covered Beauce accents in the accent series (click here for the earlier post with audio examples). However, I included them in the vocabulary list because have the effect of transforming some words to such an extent that the words, when spoken, resemble something quite different from the standard version, almost like a different vocabulary. The next couple of posts will continue to explore other regions. By Quebec Culture Blog 101 in Language and Language related on February 6, 2015 .